It has been some time since our Bibliophile and Bookbinder had their last conversation about bookbinding and the trade. In the spirit of Collin and his Bone Folder (Der Pressbengel) I continue that conversation to draw in some German binding styles not included in the original text but of that time. I invite you to join the conversation in the "comments" section below, too. BIBLIOPHILE: Don’t laugh. I’ve been working on it constantly and the more I do so the more questions I have. I had no idea there were so many facets to bookbinding and even art. As I was looking through some reference books at home and at the library I came across some bindings that you did not tell me about, perhaps because they are too common and beneath a binder of your reputation. Yet, as I was pondering them they struck me as perhaps the most honest in how they were made and are used. BOOKBINDER: Really, this could be very interesting. Do you have examples with you? BIBLIOPHILE: Not of both, but I do have an example of the smaller one in my coat pocket. It is very simple binding on a trade publication, comfortable to hold, not too delicate, unadorned, and very affordable. I have seen it used for school books, notebooks, address books and never really paid any attention to how they were made. But since our conversations I find myself critically looking at anything resembling a book. You have opened my eyes more than I could have imagined when we first met. BOOKBINDER: Hmmm, yes that is a stiffened paper binding [Steifbroschure]. We, and by that I mean the trade, use it often for ephemeral items, or as an interim binding for something that book lovers like you might want to have bound properly. Although I am familiar with them and made one during my apprenticeship, it is not something I am interested in producing in my bindery – I usually refer them to a colleague who specialized in more modest, less expensive bindings. He also does work for some of the libraries in the area. I suppose they do have their place though. BIBLIOPHILE: Tell me more about them so that I may understand your aversion to them. I could see them as a very useful binding for many books that may not be worthy of a fancier binding. BOOKBINDER: Well, there are many reasons, but the main reason is that the structure is weaker and looks cheaper when compared to a “real” binding. Often, especially for things that are to be rebound properly like a finely printed text, this minimal structure is appropriate in the short term, but what happens if it is never bound? If “holländern” [a very rudimentary form of sewing a text that originated in Holland [PDV1] is used the sewing is very weak and the only thing holding the text together is glue and a single thread. Then, we often use a very thin calico cloth that is glued directly to the spine to cover with everything else being paper. The cheapest ones may not even cover the thin boards – not a very durable combination. That may not matter, but why not bind the book properly from the beginning? BIBLIOPHILE: As always Master you make good points, but what if I want to read the text and think about it before asking you to bind it. Wouldn’t it be better to have it protected at least that little bit? BOOKBINDER: Perhaps… For the other types of “books” you mentioned such as school books, notebooks, address books it may well not matter much if they do not last. Still, there are simple ways we can use to make them stronger. We could, for example, sew them on tapes, and stiffen the boards with thin card. Perhaps one could even use a stronger cloth on the spine, perhaps with a nice decorated paper, or one could cover the whole book in cloth and just turn in at the fore-edges. But even then, why not bind properly? BIBLIOPHILE: That is very interesting and gives me ideas. Still, I believe that you are right in saying that the binding is not very durable. That would also mean one shouldn’t use it for larger or heavier books. In that case I agree that one should just bind it properly to begin with. But, don’t you think that the style has its place in your selection of tools? I am trying to remember who it was, but I recently read in one of your trade publications that "'good enough’ is sometimes an appropriate, and even a noble goal, not an abomination.“ [PDV2] I think it was in the Allgemeiner Anzeiger für Buchbindereien. Don’t you think that might be the case with these unassuming bindings? BOOKBINDER: I suppose you might be right, but there is a reason that these stiffened paper bindings are not described very often in our bookbinding manuals. Often one does not even need to know how to bind a book in order to make one. Even a printer could make one – a trade that often does not even understand the importance of grain direction. BIBLIOPHILE: Hello Master! Thank you for sending your apprentice over with the first of the books you bound for me. I am completely enamored with the delicate paper case bindings you made for my collection of poems. The pastepaper harmonizes beautifully with the delicate leather trim on the spine – headcaps you called them? – and the corners. Here is my payment. Unfortunately I was on my way out when he came by and couldn’t pay then. BOOKBINDER: I am delighted that you are pleased with the binding. It is a style I truly love for its honest simplicity, especially when well done. I’ve been thinking more about our earlier conversation – the one about those stiffened paper bindings. I was especially struck by your comment about something “good enough” being an appropriate goal. It is a very basic binding, one that is very easy and economical to make. That doesn’t mean it can’t be well made with almost the same amount of effort. When I was making a delivery to a very good client, a professor with a large library and many students, I noticed several books on a table that were bound in that way. Of the ones I saw that even the oldest one from the 1860s, a dissertation., It wasn’t pretty, thin cloth on the spine with boards undecorated except for the front of the wrapper that had been glued on, but had held up quite well with seemingly heavy use. Then I noticed others with marbled papers and other combinations of materials. I admit with a sense of chagrin that they have grown on me as an acceptable style of binding that I could see producing in my bindery. A nice economical alternative that could appeal to many who would like something very basic yet attractive. I will need to experiment so that I can discover the many variations that are possible. It would even be useful for my apprentices to learn. They even teach it in trade school now because of that Professor Adam (1849-1931) in Düsseldorf. He has spent a great part of his life trying to change how we train apprentices, and what they learn. It might even be something I could offer my clients in a more distinctive version. I do need to be careful about my reputation, especially in this economy. BIBLIOPHILE: I’m sorry, but I must rush out. Next time I will remember to bring that other book I wanted to ask about. It’s rather strange style of binding – one I have not encountered before. 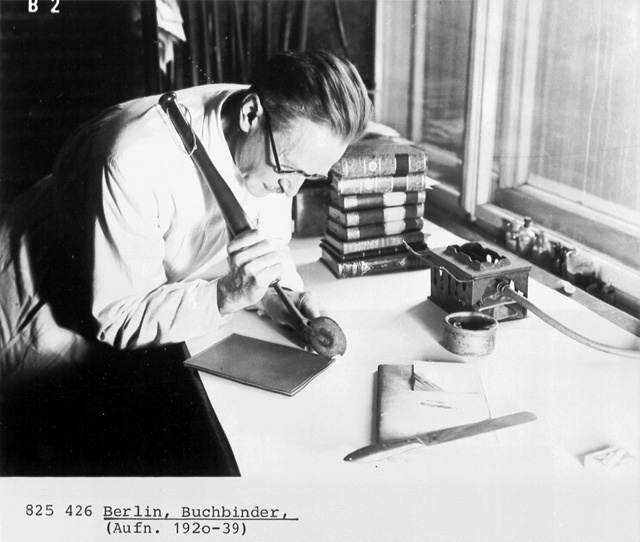 BOOKBINDER: Until then, and hopefully I will have finished some more of your books. I thank you for this conversation and making me challenge my assumptions. [PDV1] Ludwig Brade, Emil Winkler, Das illustrierte Buchbinderbuch heißt es im 23. Abschnitt über Broschüren: "Durch das Heften der Broschüren bezweckt man die inneren Lagen der Bogen beim Aufschneiden derselben fest zu halten, damit sie nicht herausfallen, deshalb wird es so einfach als möglich ausgeführt und zwar auf die Art, welche man holländern nennt. Diese Bezeichnung hat ihren Ursprung darin, daß man jene Heftart zuerst in Holland anwendete und sie später auch in andere Länder überging. [PDV2] Karen Hanmer in an email to the author about this binding style. 4/26/2012.